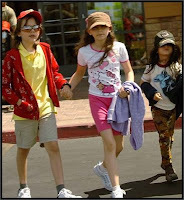 Michael Jackson’s kids are getting the sweetest allowance ever! Paris, Prince and Blanket just got their allowance upped — from $60,000! Really??? Apparently, the accounts guardian and lawyers underestimated their monthly expenses & requested the increase! What are they spending on!!! That’s 20,000$ each a month!!! Can you imagine?! What happenned to working for your allowance?! Washing cars, slinging newspapers on front porches?! lol What did you have to do for your little allowance?! Among your friends, who had the highest allowance and how much was it?! ***** In other news, Prince and Paris are rumored to be making an appearance at this Sunday’s Grammys’ Special Merit Awards ceremony to accept a Lifetime Achievement Award for their father. A video of the award presentation is expected to be shown at the Grammys.